As you can probably tell, we had a busy holiday. And in due course, you'll be hearing about quite a few of the places we've been to, because there's one thing I must say first of all... I was in castle heaven! Ruined and whole and stretching from Roman through Norman, Medieval and Tudor right up to WWII - this holiday had it all and then some. Let's start at the beginning, though: where did we go? We spent a week in the south east of England and our holiday explorations straddled the border between East Sussex and Kent. In the spirit of the thing, and given our love for unusual places, we stayed just outside the village of Bodiam on a farm. Not unusal you think? Wait until you see what we stayed in. As romantic retreats go, this one takes the palm. 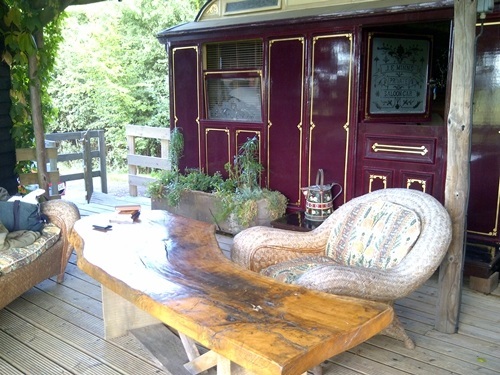 Our 'cottage' was a luxury, restored showman's carriage dating back to 1890 - and it's easy to imagine yourself beside a Victorian fairground. The owner has really gone all out to make this a lovely holiday retreat, adding mod cons the Victorians would not have known as well as a covered deck where you can sit and look out over apple orchards and Bodiam Castle while enjoying a glass of beer, as the area is famous for growing hops, or cider, as this is what much of the farm's produce is turned into. With a famous castle right on its doorstep and within easy travelling distance of numerous other castles and historical sites, we couldn't have done better if we tried. 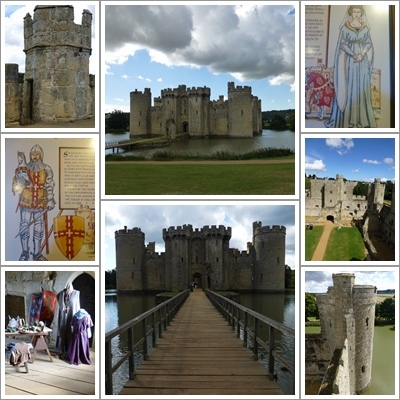 Bodiam Castle was within walking distance, so we made that our first stop the next morning. It's an image that graces postcards and calendars the world over, the high walls, round towers and moat proclaiming it the quintessential English castle. Which it's not. Bodiam was built towards the end of the 100-years-war, at the beginning of the age of gunpowder and cannons, when castles had outlived their military usefulness. It was status symbol and luxurious home as much as fortress, designed more to impress friends and neighbours than cow enemies. It does the job magnificently, too. The setting is stunning and if you take a walk around the moat you're excused for believing you could step right in and sit down to feast. Once over the bridge and through the gate, though,it's a different story. There's not too much left of the domestic buildings and some of what's left tells a confusing story. So it was great that we had volunteers at hand - costumes, weapons and all - to help the visitors make sense of the ruin. High point of my day though: climb the towers for the view, walk along the top of some of the remaining walls and finish off with another circuit around the moat. Blissful! I love plums and during our holiday John, the farm's owner, very kindly offered us a taste of his harvest. I don't tend to cook that much on holiday, so a large bag of plums came home with us. They were ripe and very sweet and very easy to turn into a spicy plum bake. It's one of the simplest things I know to do with plums - bar eating them as they come off the tree. Allow 4-6 plums per person - or throw measurements out of the window and just enjoy as many as you have. Heat your oven to a medium temperature, 180°C / 350°F / gas 4. Arrange the plum halves in your baking dish, cut side up. Sprinkle with sugar. How much sugar depends on your sweet tooth and the sweetness of the plums. My Bodiam plums were so sweet and juicy that I only added about 2 tablespoons of sugar to about 500g of plums. Add a little water or red wine to the baking dish. A few tablespoons will do, just to keep the plums moist and stop them from sticking to the dish. Then cover the dish with a lid or a layer of foil and bake in the oven for 15-20 minutes. Check after 10 minutes and remove the lid or foil if your plums are swimming in juice. You want the plums soft but still holding their shape and the steam coming from the dish mouthwateringly fragrant. How long that takes really depends on how ripe your plums are, so keep an eye on them. One of the most delicious ways to enjoy plums. I hope you like it, too. There'll be more castle adventures to share, amongst them Lullingstone, Dover, Deal, Walmer, Pevensey, Scotney, Rye, Sissinghurst and Hastings. Plus a few other things I've long wanted to chat about.